BOSTON — As high school seniors across the country receive college admissions letters this week, Environment America Research & Policy Center is announcing which schools are in and out when it comes to the transition to renewable energy. In a new study released today, colleges and universities were ranked in five categories based on their shift to renewable energy sources like solar and wind power. Campuses from 19 states and Washington, D.C. are featured in these rankings, which offer a multi-dimensional snapshot of progress toward 100 percent renewable energy. The rankings, which list the top 10 in each category, are based on colleges’ and universities’ reports to the Association for the Advancement of Sustainability in Higher Education’s (AASHE) Sustainability Tracking, Assessment & Ratings System (STARS). The categories for renewable electricity, renewable electricity on-campus, renewable electricity off-campus and renewable heating, cooling, hot water and other non-electric energy are calculated per student. This report comes amid a wave of action on college campuses during the past year. This fall, the University of California system announced a shift to using only renewable sources for its electricity by 2025, and, starting this June, its 10 campuses will also require new buildings to run on non-fossil fuel power. This spring, the University of California, Berkeley, committed to getting all of its energy — electricity, heating and cooling and transportation — from renewable sources by 2050. On the East Coast, Boston University, which has the largest student body of any university in Massachusetts, announced plans to purchase wind energy to meet 100 percent of the campus’ electricity consumption. Brown University, in neighboring Rhode Island, committed to reducing its greenhouse gas emissions by 75 percent by 2025 and to eliminating the use of fossil fuels by 2040. 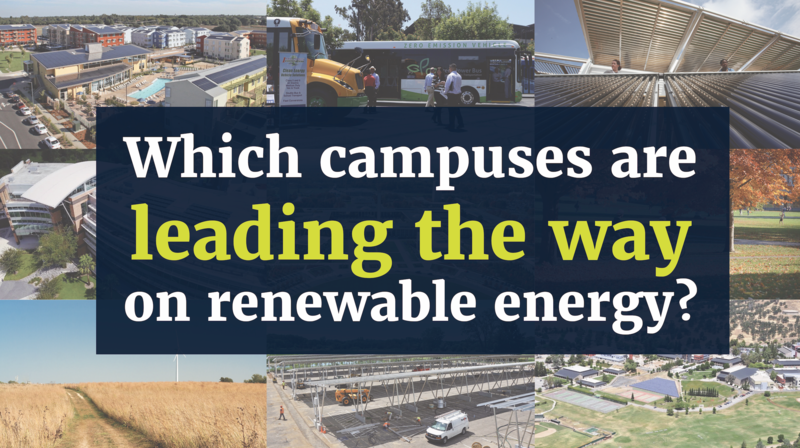 These campuses are highlighted in the report as the next leaders expected to join the list of top colleges and universities, as their commitments to 100 percent renewable energy are implemented. Across the country, Environment America Research & Policy Center and its partners at the Student PIRGs are working with students on more than 50 campuses in 15 states to transition higher education to 100 percent renewable energy.